These doors will function down to -40 degrees F/C. The door will still work below this temperature, but it will get frosty and the weather seal will freeze to the frame. 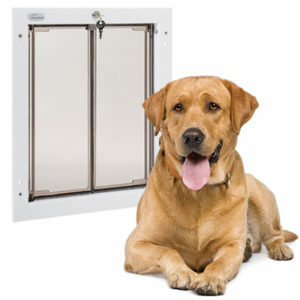 Alaska is the best selling state per dog household for the PlexiDor, and these doors have been opening, closing, and sealing out the cold in Canada for more than 20 years. What allows the PlexiDor pet doors to work in extreme temperatures? The K9-Composite is created to withstand abuse from both weather and items hitting it at full speed. For instance, dogs running through as fast as they can, or boys throwing a hard ball at the door. (It is great fun.) The service life of these panels is 20 to 30 years. The PlexiDor uses a nylon pile weather seal, designed for millions of cycles in cold weather. This weather seal is used in doors for malls and movie theaters. All corners are thoroughly fitted together with metal fasteners and clips. What would it take to make the panels freeze up? High humidity areas can cause the PlexiDor panels to freeze up. Do not mount the door near dryer wall-vents; the moisture can cover the panels, allowing ice to form on the weather seal. If that happens, the panels will be frozen to the frame. Also, do not mount the door where it will be misted with water, such as near a sprinkler head. 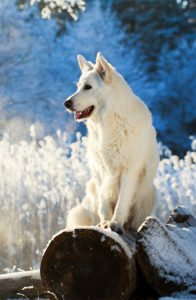 If you have any questions about pet doors working in cold climates, call our office at 800-749-9609 and speak to customer service.